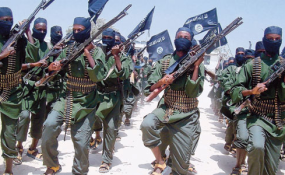 Al-Shabaab is reckoned to have a large number of foreign jihadists widely known as al-Mujahedeen al-Muhajereen. The South West State information minister, Ugas Hassan Abdi, said, "The attacks were carried out by two suicide bombers wearing explosive belts." He said officials were still assessing the casualty figures. The al-Qaida-linked al-Shabab extremist group, which controlled Baidoa between 2009 and 2012 before being driven out by Ethiopian-backed government forces, claimed responsibility for the attacks. A survivor told VOA's Somali service that a suicide bomber threw a grenade at a busy restaurant, killing at least five people and injuring several others. "A young man rushed to us and hurled a grenade at a crowded restaurant. He was shot before he detonated a suicide belt he was wearing," said Aden Nur. Minutes after the first attack, another suicide bomber rammed a vehicle into the Bilan Hotel nearby. The assaults came as the city prepares for next month's election of the head of the country's South West State. The former No. 2 leader of al-Shabab is among the candidates. The Somali government said it would block him from running for the post because he was still under U.N. sanctions. Baidoa is about 240 kilometers (150 miles) northwest of Mogadishu, where residents remember last year's attack that killed hundreds of people. On Oct. 14, 2017, a truck loaded with explosives barreled down a busy street in Mogadishu. The explosives were detonated, killing nearly 600 people and injuring hundreds. It was the deadliest terror attack in Africa's history. A monument honoring the victims was lit up in red on Friday in preparation for a ceremony on Sunday. In a cabinet meeting, the Somali government said security would be tightened in the area to allow residents to commemorate their fallen family members and friends. The shock of the Oct. 14 attack still troubles the city's residents, Somalis across the country, and the country's diaspora communities around the world. Abdullahi Ali Mohamed and his wife had two small kiosks at the blast site. He was among the many unconscious and critically wounded survivors taken to Turkey for treatment. He lost his wife that day in the blast but did not find out until a month later. "I regained consciousness in a Turkish hospital a month later. That was when I was told that my wife died in the blast. She was vending at one corner of the junction the last time I saw her," said Mohamed. Five months after his recovery, he went back to Mogadishu. He said he tried to stay away from the site for the first few days to avoid painful memories, but he had to return to establish his kiosk business. "When I came back, I had to pay my rents, bills and debt that piled up during the months I had been away. I had to pay for the milk for my two kids and I could not get an alternative job or source of income. Therefore, I came back to the same site where I lost my wife and had a dreadful and shocking life experience," he said. "One must never despair of life." Abdi Hassan Ali, one of the business owners at the blast site, left his business hours before the blast. He lost his older sister, Faisa, who replaced him for the shift. "It was a dark day, a day that will remain fresh in my memory. The day I lost my older sister, who was my tower of strength," he said. "The fact that I did not find the remains of my sister and that I rebuilt my business location keeps troubling me." Blast survivor Issa Ali Duhulow is still running his business at the site. He said, "I am survivor. Allah saved me from the blast. I got shrapnel injuries, but I've recovered from them and I'm back to business. Life goes on." Abdullahi Mohamed Ali, who was in charge of the National Intelligence and Security Agency at the time of the attack, told VOA Somali, "It was a very painful moment in my life, and still a never-vanishing scar is somewhere in my brain. The pictures, the human remains, the blood and extent of the devastation we saw as first responders were extremely horrific." Mogadishu's mayor at the time, Taabit Abdi Mohamed, still wears a red arm band to mourn the victims. He says he will keep it on until Sunday's memorial activities end. "The painful and the ugly terror attack did not only hurt Somalis but also touched the hearts of all human beings in the world," he told VOA.